Driving to the grocery store I see a father in his lawn running madly after a little girl in a pink bathing suit and pigtails. She is squealing with joy as he squirts her with the hose. I smile and the father sees me looking and smiles back. I turn the corner and the smile fades quickly. Tears fill my eyes and I curse them away, angry with myself for allowing someone else’s moment of happiness to shine a spotlight on the sadness inside me. I didn’t grow up with a playful father. I don’t remember him chasing us, tickling us or squirting us with the hose. I have no memories of being thrown into a pool, playing catch or giggling madly as he makes silly faces at me. I’ve searched my memory and those things just aren’t there. I can remember going to museums, day trips and being dropped-off at roller-skating lessons. There are memories of seeing him at his computer, visiting him at work and picking him up at the airport after business trips. There were Shakespeare plays, discussions about homework and watching TV. He was at all my horse shows, band performances, speech competitions and theater productions. There was never a doubt he was proud of me. But as hard as I focus, I can’t find any memories where we are laughing and playing together. I can’t remember him hugging me or kissing me goodnight. I don’t remember hearing “I love you” or him holding me as I cry. This is the source of the tears and the sadness. There is this picture of me at around my daughter’s age. I’m wearing a pale blue nightgown with a dainty pink ribbon on the front. I’m sitting in my Holly Hobbie bedroom on my dad’s lap. His arms are wrapped around me. I have my hands folded in front of me and I am smiling. Our faces are close and it looks like he might be about to give me a good night kiss. I’ve studied this picture for years, trying to remember what it felt like to be in my father’s arms. I wish I could feel the sense of warmth and love the picture suggests. I wish I could remember. As a mother now, I think about my dad. I imagine how lonely he must have been, as he and my mom didn’t have a very loving marriage. He worked all the time at a stressful job and was exhausted at the end of the day. There are days when I can’t muster a board game or even to read a story to my kids. I find them irritating, far too loud and just plain annoying. I just want everyone to shut up and nobody to touch me. I lock myself in my bedroom with a few beers and pray sleep comes soon. My children don’t have a playful father either. He doesn’t chase them, make them giggle or ride bikes with them. There is very little in the way of interaction most days and it makes me feel all the sadness and longing all over again. I get so upset at my husband and wish he could be the father I wanted growing up. The one my friend’s had. The dad jumping off docks, teaching them to fish, taking them on daddy/daughter dates and always telling them they were beautiful. The dad who made his daughter feel like something special, instead of always feeling not good enough. I know it is unfair to pin any of this on my husband. He is not my father, but pain and longing are irrational beasts that don’t care about logic. They tear at my gut and whisper unkind things to me about my own kids. They remind me that everything is my fault. My issues of feeling unloved, unworthy and unheard make me look at every interaction with a childish sense of injustice. I’m always looking at how my kids are slighted. How I am slighted. I always feel like I’ve been handed the short stick in the love department. I see my husband talking with our kids. They sit on the couch and have discussions about space and science. 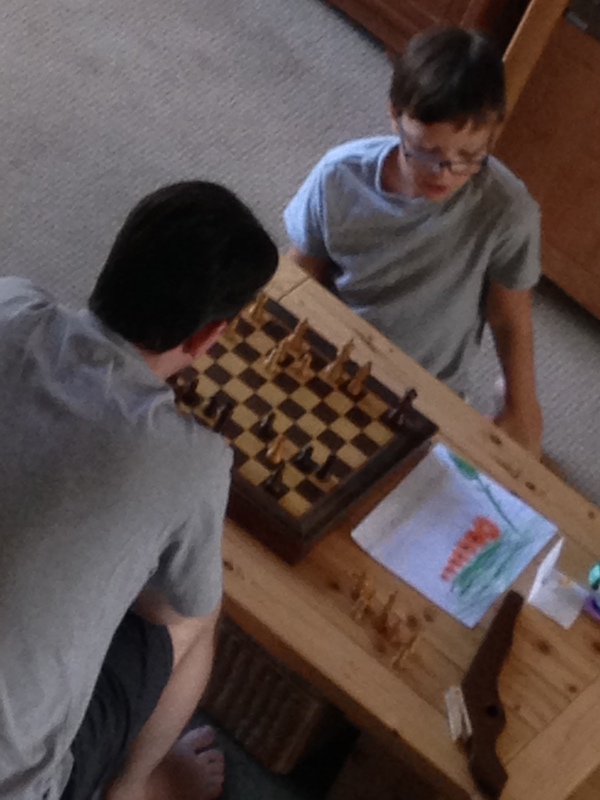 They play chess and he talks to them about classical music. There are museum trips, Legoland, Disneyland and one epic trip to the Bahamas. Taco Tuesdays. Go-kart races. Ice cream when mom is away. Every night, after I read stories, he comes in and tells them goodnight. He kisses them on the forehead and brings them a glass of water. He says he loves them. Every morning, I see him peek at them sleeping in their beds as he leaves for work at 5 a.m. These are the ways a quiet man like him loves his children. These are the memories they will have of their father. It has nothing to do with me or my dad. Time to give up the pain. This entry was tagged Blame, Daughter, Fathers, Guilt, Love, Memory, Playful. Bookmark the permalink. I wish I had either one of these fathers. Mine was more interested in his liquor bottle and his own friends than he ever was in either his children or his wife. He never played, neither games or otherwise, nor did he ever show up to my school events, much less take us to a play or a museum. The only way my father knew how to show love was through gifts, and those only came on Valentine’s Day or Christmas. He got big, expensive gifts as though he were trying to make up for the lack of affection and attention the rest of the year. And I have spent most of my life trying to make him happy and proud. No more. It is time for me to make myself happy and be proud of the woman I have become in spite of my father. As I get older, I am beginning to realize that he has his own demons to fight, and they are not my fault. He was just doing the best he could with the emotional tools he had.